Students create their own version of a beautiful, brilliant butterfly using clay! Did you know that North America is home to more than 700 species of butterfly? Not only are they beautiful to look at, they play an important role in the pollination of flowering plants and are great indicators of climate change and habitat destruction. 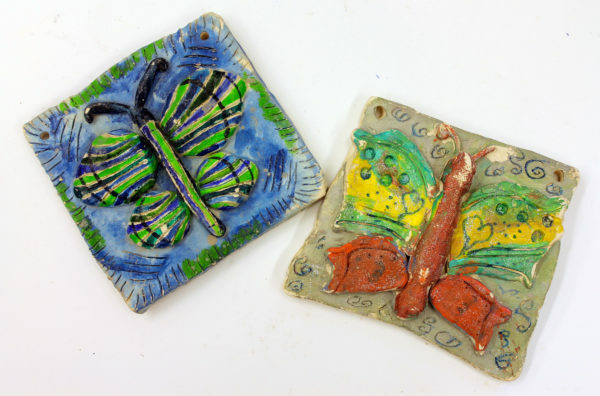 Students examine an actual butterfly and view photographs of a variety of species before being led step-by-step through the process of how to build a symmetrical clay butterfly using hand shaped slabs and coils. What are the learning outcomes for students? Explore land based learning concepts and discuss environmental impacts on butterfly habitats. Discuss common butterfly species in Alberta and why colour, symmetry and pattern are important for their survival. What are the learning outcomes for teachers?